Model Twenty-One radio - aux input? I just picked up a working Model Twenty-One in so/so shape - missing the power knob, plastic grille has shrunk causing it to peel off the masonite. However, it works - though I cannot tell if the tuner is bad - got some static on 91.7, other channels are clear. For the time being I'm going to print a new knob, and have to figure out a strategy to restore the grille. So... I've sort of always wanted one of these radios but now I realized, I never listen to FM. Or AM for that matter. Are there any minimally destructive ways to add an Aux-in for a line in source? Ideally I'd route any wires without drilling into the case. I don't have a good impression of FM transmitters, but could always give one a try. If the answer is 'no' or 'burn the heretic' then I'll set it aside until I have time to restore it fully (per this guide: https://antiqueradio.org/KLHModelTwentyOne21FMRadio.htm). I've restored many Model Eights and several Twenty-Ones. There were actually five different "Model Twenty-One" radios: the original, II, FM, AM/FM and CL. 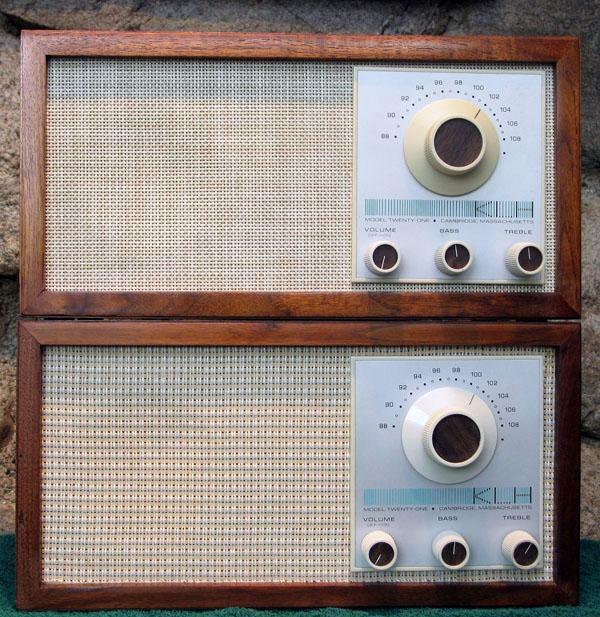 The last 3 were Singer era radios with the same excellent tuners and speakers but tacky "wood-grain vinyl cabinets. The CL was a clock radio and the clocks ALWAYS broke. But to your question: No. Sorry. I make an Aux input for the Model Eight but there is no easy way to do that for the Twenty-One. I do make a headphone adaptor for the Twenty-One but that's not what you're looking for. That restoration guide you linked is a good start. 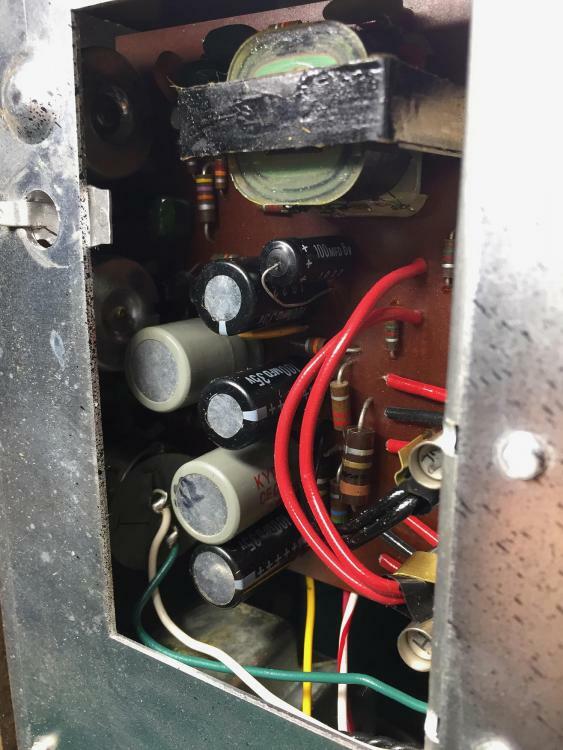 I recommend always replacing the filter capacitor. It's easy. Those grilles always shrink. And you cannot stretch them (believe, I've tried). I've used vinyl cross-stitch material from Michael's, which looks pretty good (pic below--new grille on top radio, original "patchwork" on bottom). Another option is to remove the old plastic grille and cut and patch it. I can send you pics and instructions by PM if you want. Thanks! The patchwork option looks like it would work. I was hoping the grille could be heated gently and slowly stretched. Years ago I rewired a sapphire push button radio with an aux in - someone online helped me figure out where to tie into it. I wired a selector switch so I could switch between radio and aux. Since this is mains, to do it safely, I suspect the wiring might be more complex. Yeah--heating and stretching will not work. I've tried. I'm sure someone with much more knowledge about radio circuits could tell you how to rig up an Aux input but it would involve some wiring modifications as well as drilling into the cabinet somewhere to add a jack and a switch. I'll PM more detailed instructions for the patchwork quilt. Earlier in the week I broke down and ordered a cheap FM transmitter from Amazon. It works pretty well, and for less than $10 total, was worth it. What surprised me the most was how much of the spectrum it uses - that is, I set it to 80 and tuning to that exact spot was quite easy - it seemed to overlap .25 under and above. Hard to tell with the dial since it doesn't have precision tick marks. I finally had a chance to crack it open - actually I just picked up a B&W 14" RCA TV and figured I should restore this radio before I even attempt to think about touching the TV. 1) Which is the filter cap? I looked the schematic over, nothing is marked 'filter' but the 2000µF capacitor looks like the one mentioned. Looks ok, going to replace. 2) Replace other electrolytic caps regardless of how they look? The picture makes the 100MFD cap look like it is bulging, but when I look at it it doesn't look bad. 3) What was the purpose of the black putty between the wood rods and faceplate? It's dried and brittle. One of the pieces of putty fell off - should I just glue this back on (was thinking super glue) to hold it in place? Curious what the purpose of this was exactly, not sure if it served an acoustic purpose, or if it was just to keep the faceplate flush with the front of the cabinet. Ah - I called it 'goo' but it was more like charcoal - hard/brittle and full of bubbles. I took the grille off but am not certain splitting will work - not only did it shrink horizontally but vertically so much that it is slightly shorter than the frame. It had also picked up some of the glue from the masonite board, I was able to get all but a patch the size of a silver dollar off. Also - thanks for all the info - I'll post some before/after photos when finished. It's probably going to take me a while to finish this project as I'm working on it in between another project that I have an actual deadline on. Stupid question... I finally cracked open my radio to start replacing caps. After taking the audio amplifier board off, some of the capacitors voltage values don’t match the schematic. For instance the three 100uF caps on the amplifier board (C317, C310, C313) are supposed to be 25v but the ones on the board are 35v. And I don’t know if it matters but there was some dried out gunk underneath one of those caps. I’m guessing it failed? The other ones are some 2uF that are supposed to be 15v, but on board they are 50v. Again, these look newer? I bought this radio from a university surplus sale... so it is possible it was repaired once or twice depending on which department it was in. It's generally safe to go higher in voltage but never lower. I suspect caps may have been changed but another possibility is that there were in-house changes to the specs that were not on the schematic. There may have been service bulletins. Hard to be sure, so to be safe I'd go with the higher voltage values. I have a photo of the audio board on one I worked on and the values matched the schematic. 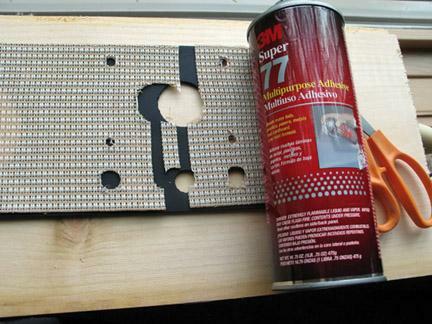 Sigh - I decided just to use what I had bought (that match the schematic). The circuit indicates 21v to the board, so I’d imagine the original cap spec will be fine... one would hope. The next time I order from DigKey I’ll order some higher rated caps. After replacing all the electrolytics on the amplifier board, and cleaning the pots and tuner with some DetoxIT, things seem fine. I can’t tell if there is any difference in how the amp operates, but there is far less static when turning the tuner. Replacing the amp’s caps was more of an experiment to see how “painful” it was using the tools I have available to me. One day I’d like to tackle a 1950’s RCA tv. Probably fine. Sounds like you know what you're doing. The photo you posted matches what the schematic says... and what I ordered (two I couldn’t get exact values for two, but ordered within 10% higher). Just have to pick up some window gasket to reseal the back, and I should have this project complex tomorrow! The higher voltage caps give you a bigger safety margin, eg. 21v on the schematic vs. 25v as spec'd, using a 35v cap makes it less likely the cap's rating will be exceeded in operation. Without putting a meter on it it's hard to know for sure what the actual voltage is. You want to use what you find for values on the actual unit, maybe slightly higher for voltages. Some capacitance values are no longer commonly used, such as 2000uf, so as Kent says you then go up a bit to 2200uf as the next best choice (not less). Some capacitance values are no longer commonly used, such as 2000uf, so as Kent says you then go up a bit to 2200uf as the next best choice (not less). I don't really agree. Never go lower in voltage, but as for capacitance, +/- 10% is fine. 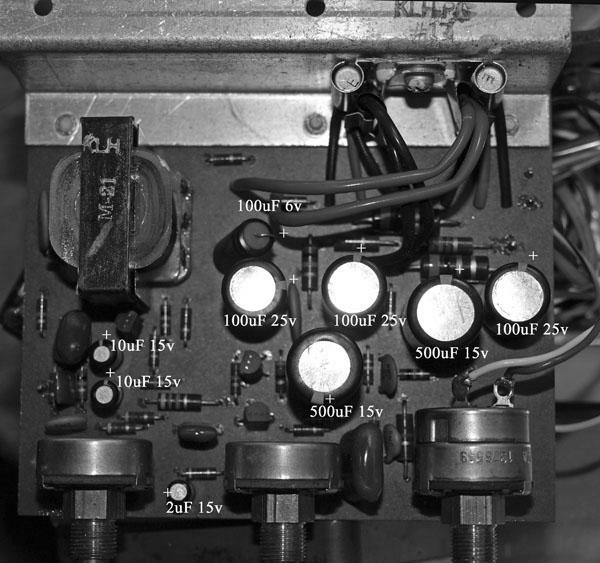 The Twenty-One board shown had some 500uF 15VDC caps. 500uF is not a standard value now so I replaced them with 470uF 25VDC caps. IIRC, some electrolytic can caps have a tolerance of +25%/-75% so no worries here. FWIW, I also replace the 60/60/60/60uF can caps in KLH tube radios with 50/50/50/50uF. When buying standard polarized electrolytics, Panasonics are very good. Also look for 105℃ ratings. Hello, I'm in the process of working on one of these now, this thread has been helpful, although finding it before ordering capacitors would have been better. Regardless, hours of messing around trying to stretch the cloth have been avoided, and the other tips and info are much appreciated. Thanks.